A couple of months ago, I was participating in a TinyChat with Jenna of That Wife and I asked her if her husband ever cooked dinner. I already knew her view about women working outside the home, but I was a bit surprised when she said that her husband never cooks and has no idea what to do in the kitchen. When the chat was over, I ate the chili and cornbread that my husband had made for dinner. This whole situation inspired me to breakdown how things work at our house and think about how it might change in the future. My husband and I both work full time and, even though I get off of work much earlier than he does, we share the cooking responsibilities 50/50. If I don’t feel like cooking or I have a late class at the gym, he’ll make dinner. If we’re having one of my specialties (like salmon – posting my method soon) or I’m trying out a new recipe, I’ll cook. It’s great to have someone to share the responsibility with and we have fun in the kitchen cooking together, too! My dream dessert table from Bakerella. At the beginning of the week, usually on Mondays, my husband and I will talk about what we want for meals that week and remind each other what we already have in the pantry and fridge. We both have equal say in the dishes that we’ll make and once in a while we’ll throw something new into the standard rotation. When I say we split things 50/50, I mean it. Sometimes I do the grocery shopping, sometimes my husband does. It really just depends on who has the money (no, we still haven’t combined finances – I’ll post about that soon) and who has some free time or feels like doing it. Honestly, I prefer to do the shopping because I like to have control over what food we have in the house – my husband tends to fill the cart with a bunch of stuff we don’t really need and isn’t really good for us – but half the time I’m either too lazy or too broke to go. Ahhhhh… my favorite part! NOT. My husband isn’t so fond of it either, which is good because nobody really bugs anyone about cleaning, but bad because our house is usually messy. We’re not the next candidates for Hoarders or anything, but if someone is coming over, we have to frantically pick up after ourselves and the dogs to make the house presentable. We each do our own laundry, as well, which is driven by the fact that we have separate closets in different rooms, so our laundry doesn’t really gets mixed up very often. Confetti is messy, but so fun… just like us! How cheesy am I? 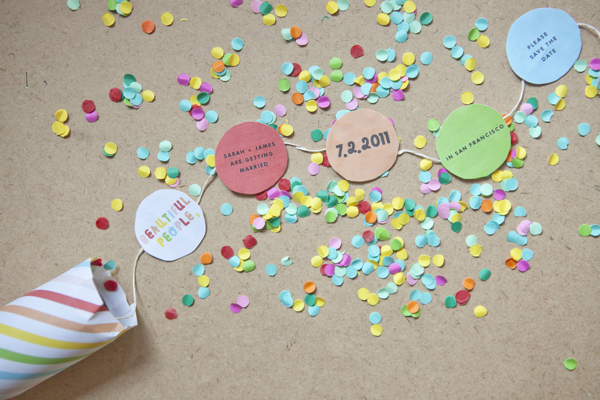 Confetti invitations from Oh Happy Day! Obviously, the reason we share all of these responsibilities is because both of us work full time, but sometimes I think about what it would be like to be a stay-at-home mom and be in charge of all the housework. While I desperately want to be able to stay home to raise our children, I’m not sure I could handle being in charge of all of the domestic duties. Thinking about that type of life, it seems to me like the man has it pretty good. He gets to go to work, go out on client lunches, hang out with adults, then come home to a clean house, clean, ironed clothes, and dinner on the table. I suppose those roles could be reversed, as well, but I do know a few stay-at-home dads and I’m pretty sure they don’t do all of the cooking and cleaning and shopping. One thing we don’t share? Yard work. My husband does all of the yard work and I help him a tiny bit once in a while. Sometimes I feel bad, but not bad enough to mow the lawn or weed the garden. Sue me. 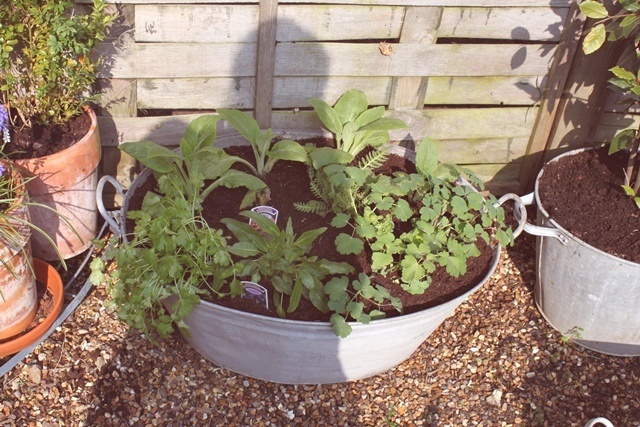 Loving this herb garden in a tub from junkaholique. What do you think? How are your domestic duties shared (or not) in your house? >Oooh interesting!! You haven't combined bank accounts?! Can't wait to read a different perspective on married finances! >I do 99% of the cooking and shopping. Its not that he can't cook, but I love to cook, and I do it way better than him. I do the shopping because I am particular about what I buy and for the most part he hates waiting in lines, but if he wants something he will sometimes go shopping. We NEVER go together, he makes me nervous.I would love to say that housework is split 50/50, but I'd be fudging the truth. He's way better at cleaning than I am, and much neater. He feels the need to clean way before I ever do. It is probably split more like 75/25 with him doing more of it. I pick up, but he cleans, unless we have company coming over, then its split evenly.Outside garden work is split 50/50. We have a gardener who comes once a week to mow and blow, so we share everything else.When I'm home I do ALL of the baby care. He is obviously capable, but I'm a control freak in that area. We just had this discussion last night, I'm gonna work on this. >We end fairly close to 50/50, but don't really share the same tasks. For instance, I'll cook and he'll clean. I'll do the laundry and he'll fold it all. He vacuums and I'll wash the floors. The only time it gets unbalanced is if we have a big project going on that takes more of his time than mine that falls on a Saturday…I'll end up spending the day cleaning and b*tching about it later.p.s. we don't share accounts either, but we keep track of all our accounts in mint.com so we know what we have and can keep to a rough budget.